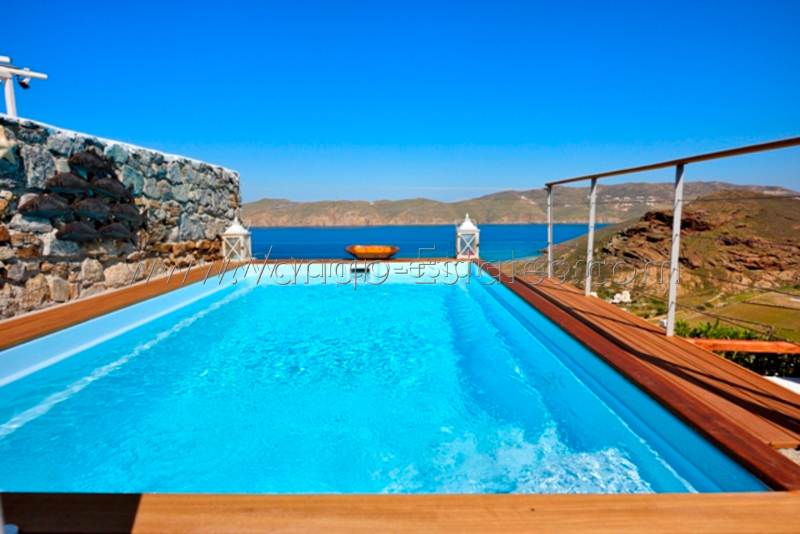 Mykonos Panormos studio is within a private gated complex of 5 independent houses each one with its private pool. It is located above Panormos bay, just 750m from the organized beach. The studio is at the end of the complex and has much privacy, the pool is within your outdoor area just above the shaded veranda where you will enjoy cold summer drinks while appreciating the sea view from the bay. As for the studio itself, it is well decorated in a Mykonian way, you have a double bed a sofa bed for a child or teenager, a kitchenette and a bathroom. The studio has air condition and an internet connexion. The veranda is well furnished with a nice and spacious table, the pergola protects you from sun and wind. Nice BBQ's can be managed in the bbq area. Panormos is a residential area, calm and close to Mykonos town (6km), Panormos organized beach (restaurant, sun beds) is just 750m, natural Agios Sostis beach is 2 km from your studio, do not forget to eat at Kiki's taverna, according to me a 'must go' in Mykonos. Flora mini market is also a 2km drive. If you are a bigger group, ask us about the other houses within the same complex, each one can sleep 6 guests all in double beds. Panormos choice consists on several points, being close to Mykonos Town, loving Panormos and Agios Sostis beach, enjoy the bay and a calm residential not crowded area of Mykonos. As the houses are adjusted everybody can come an enjoy it, families, friends or couples. Need Help Booking? Need information on a Real Estate property in Greece? Why Book with us? Why Buy with us? Get the best rates of the market.